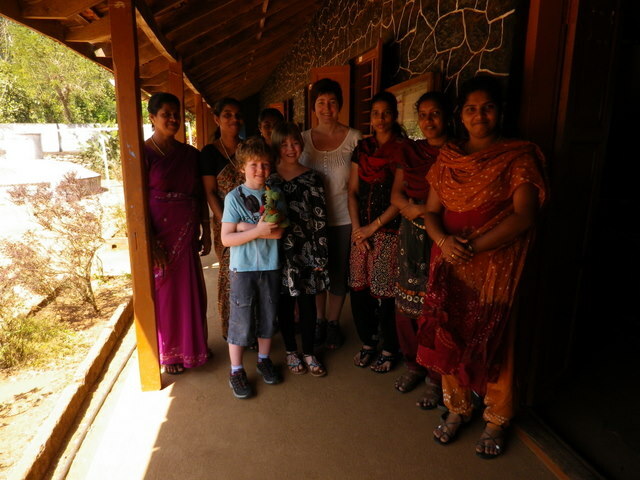 Here we are, at the end of our amazing trip to India. All is well and my worrying is finally subsiding. In fact my only worries have been; the kids getting car sick in the taxi up the mountains, a few mosquito bites, some minor heat rash and the crazy traffic! Delhi was a manic but fascinating place to start our trip, so many people everywhere and so much going on, a complete attack of the senses in every direction. What surprised me was the lack of begging and pestering which I had anticipated. Also, proper flushing loos and loo paper!! (I’m sure all those tissues I packed will come in useful another time). The Indian people are incredibly friendly, happy and kind, especially to the kids who got lots of attention along with Rosie and George (the kids cuddly toys). Morgan was very patient with all the hand shaking and hair ruffling he received! (Catch his blog later about the celebrity status he encountered). He was not so keen when one very friendly lady wanted to take him home with her and kissed him on the cheek! In Kerela, the temperature was the only thing that I struggled with, as every day it was 30C plus! This added to the worry factor, as Morgan kept getting heat rash as soon as his lovely pale skin saw the sun. Helpfully, on arriving in Alleppey, Mr B insisted on walking around to explore and get to know the area (only mad dogs and Welshmen go out in the midday sun). He assured me that this was a good way of burning off the kids energy (burning being the operative word here, hence the heat rash). I kept getting flashbacks of my childhood when my Dad would take us walking on our holidays and his encouraging mantra would always be; “Not much further now!” as we plodded on and on and on……..
Needless to say, after that, we have stayed out of the sun as much as possible and Granny Pat will be happy to learn that I have bought a brolly for the sun, as this is what most of the locals carry to stay in the shade. In his favour though, Mr B has been an absolute star in putting up with my slightly tetchy behaviour when arriving in every new place that we get to. A terrible trait of mine is taking at least several hours to adjust to a new location. Once I have sorted the room, had a shower and made the place feel like ours I start to relax a little, unlike the kids who seem to be able to adjust immediately and throw themselves into every new situation with gusto! They have been fantastic and we have been amazed at their stamina and energy. Mr B has also done a fantasic job of organising and planning out everything meticulously which has made the trip run smoothly and is helping to reduce my worry levels dramatically. The food has been great with a suprising amount of variety and choice which has pleased the kids no end, as they are not great with anything more spicy than a pepperoni pizza! Saying that, they have both been great at trying new things, especially at the Homestay in the mountains, the Manayath Heritage Residence, where we were the only guests and had our meals cooked for us. Once prepared, the family then stood and watched us eat (no pressure kids)! As this was the only meal they were getting, they had to give it a go! Morgan has now decided that he loves fish which is a major culinary breakthrough! This particular Homestay in the mountains was an absolute haven (as I am sure Mr B will describe in much better prose than myself). 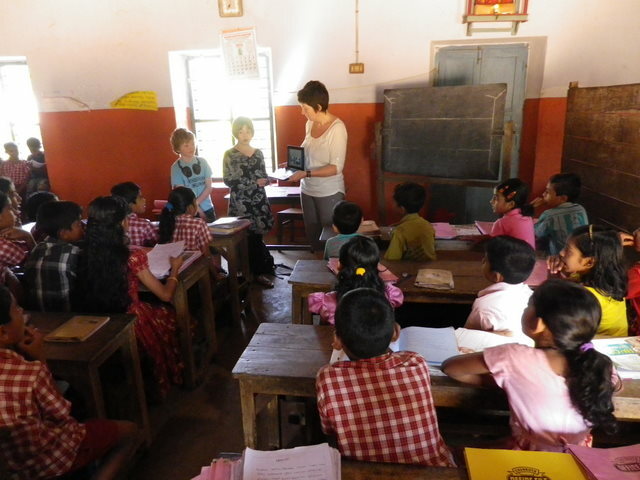 One of the highlights for me was visiting a small local, rural primary school. 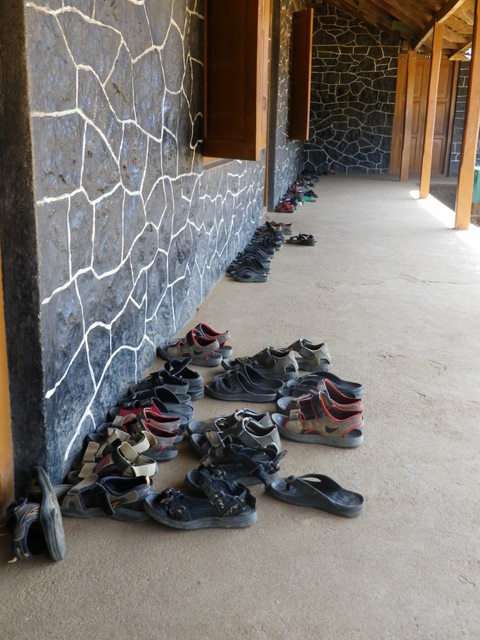 Footwear outside class please children! They had never had European visitors before and rarely even saw white folk like us (we are particularly pale let us not forget)!! On arrival, we caused quite a commotion and I was slightly concerned that we had completely disrupted the mornings’ education. However, they were delighted to meet us, especially Morgan and Josie who stood at the front of the class and told them about our little school in Ogbourne St George. Josie had prepared a presentation on the laptop with some photos which the children found fascinating. There was only one teacher who spoke a little English and the others spent most of the time giggling shyly and taking photos on their phones. When we left, all the kids rushed to the door to shake our hands and wave goodbye. A great experience and one we will always remember. All in all India has done us proud and we have loved it!! And finally, for all cynics out there… no Delhi Belly! What a lovely piece of writing – it is so gentle. You were obviously very taken with India. I am so pleased that you all had a positive time. Lovely to hear from you Gilly. It’s great being able to follow your travels. Martha was asking if she could skype with Josie sometime? I wasn’t sure how often you get the chance and didn’t want to take up valuable family-skyping time! Take care (pointless saying that really having read the blogs!). Josie would love to skype Martha. Will work out time difference and try to catch you at a good time. We are off to Borneo today, so it may be a couple of days before we are in touch again. Nice to hear from you Gilly, at last. What great pictures! My new computor has now been fixed (this morning). Tell Ian the Del technician came first thing and put a complete new board in and hopefully I can get fixed up with skype. Will send a googlemail when I am up and running! Good to hear from you Davinia. Hope all is well at Collingbourne. Give my love to everyone!